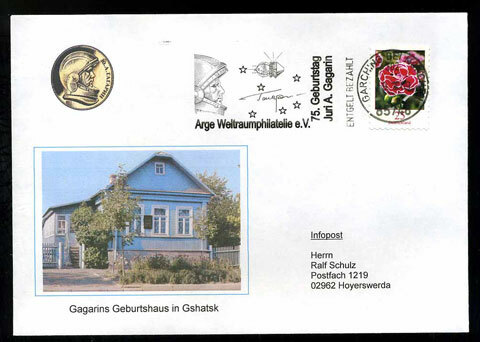 The following postmarks will be issued during the International Year on Astronomy in Germany. 1) A stamp commemorating Johannes Kepler will be issued during the IBRA/NAPOSTA Stamp Fair/Exhibition on 7 May 2009. The usual First Day of Issue postmarkers at Berlin and Bonn and a pictorial postmarker at Essen will be used. 2) Pictorial postmarker with a mobile sales stand of the German Postal Service will be available on the same day (7 May) at Weil der Stadt, Kepler's birthplace near Stuttgart. 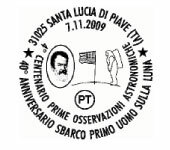 The illustration of the postmarker will show a portrait of the astronomer and an image of the Herschel satellite. 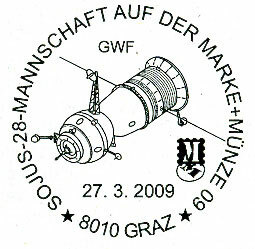 Pictorial cancel: "Sojus-28-Mannschaft auf der Marke + Münze" (Soyuz 28 crew on Marke + Münze Stamp and Coin Fair). 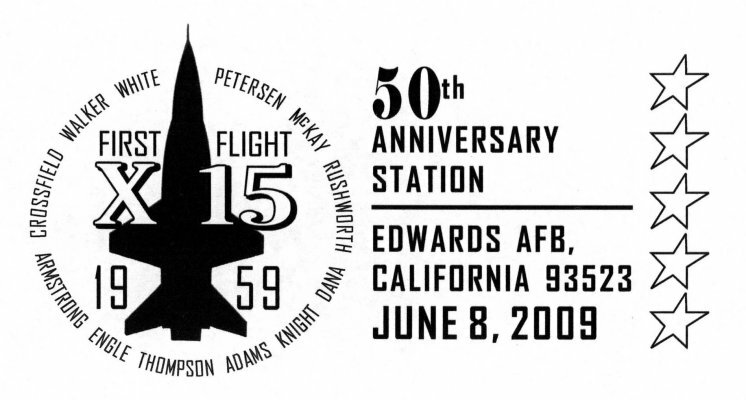 Note: there will be cacheted covers with personalized stamps and a rocket mail cover for this postmarker. a) Postmark Permit Meter Slogan type of cancel (German Post) used at 85748 Garching. "75. 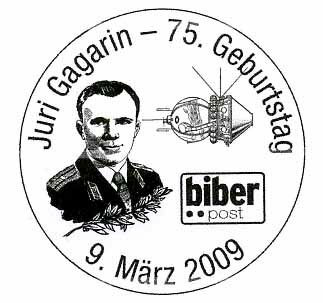 Geburtstag Juri A. Gagarin" (75th Birthday Yuri A. Gagarin). Cacheted envelopes available for 2 Euro from the organizer. b) Pictorial postmarker to be used on private mail company stamps; cacheted envelopes. Contact: Ralf Schulz, Postfach 1219, 02962 Hoyerswerda, Germany. c) An "Infopost" machine cancellation was used by Deutsche Post (German Postal administration). 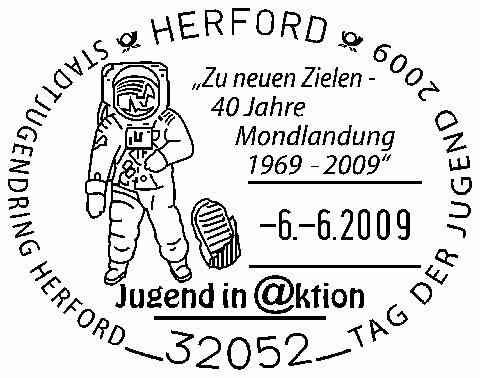 Ill.: Astronaut in white spae suit; footprint on the Moon, "Youth in @ction" logo. 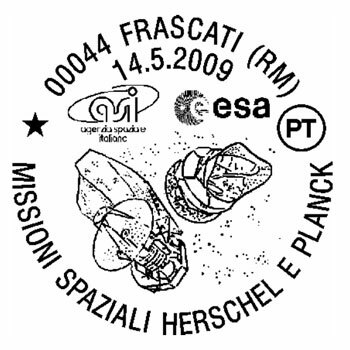 Image: satellites Herschel and Planck; ESA and ASI logos. Ordinarily requests for special postmarks are honored for 30 days after the event, so there is still time to send in stamped covers. 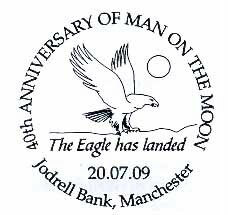 Text: "40 Anni dallo sbarco sulla Luna"
Text: "40th Anniversary of Man on the Moon/The Eagle has landed"
No image yet, but the post office in Wapakoneta, Ohio plans a special cancellation for the 40th Anniversary. The Armstrong Museum will sell its specially designed covers from 9:30 am. to 5 pm. 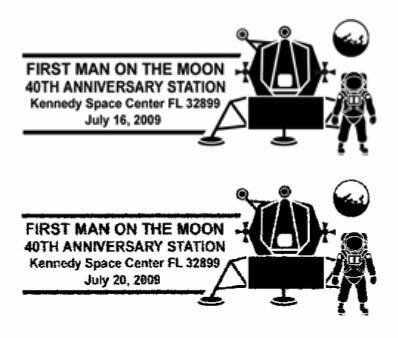 The Post Office will hand cancel these and other stamped envelopes with the 40th Anniversary postmark from 10 am to Noon only (with hand cancellations at the Post Office in the afternoon). 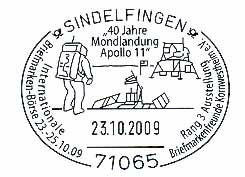 Text: "Celebrating the 40th Anniversary of the Moonwalk/First to the Moon"
USPS Postmaster, Armstrong Museum Station, 12 South Willipie Street, Wapakoneta, OH 45895-9998. Serial no. 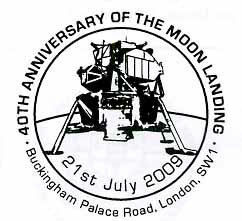 11410 "40th Anniversary of the Moon Landing/Buckingham Palace Road"
Royal Mail, London SHC, Mount Pleasant, Farringdon Road, London EC1A 1BB, United Kingdom. 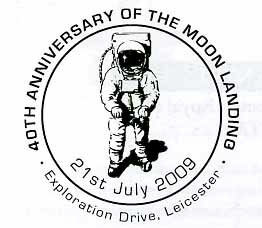 "40th Anniversary of the Moon Landing/Exploration Drive"
Royal Mail, Midland SHC, Birmingham Mail Centre, St. Stephens Street, Birmingham B6 4AA, United Kingdom. 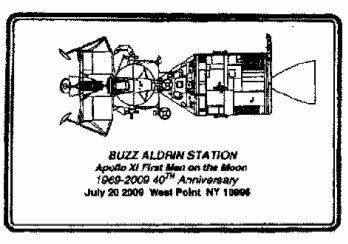 Text: "Buzz Aldrin Station/Apollo 11 First Men on the Moon/1969 - 2009 40th Anniversary"
USPS Postmaster, Buzz Aldrin Station, P.O. Box 9998, West Point, NY 10996-9998. 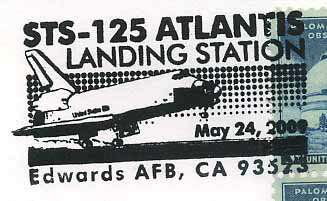 Late, but not too late: two pictorial postmarkers used at the Kennedy Space Center. The grace period has been extended to 60 days. Text: "First Man on the Moon 40th Anniversary Blast Off Station"
Ill.: Astronaut in front of the lunar landing module, Earth rise in the background. USPS POstmaster, First Man on the Moon 40th Anniversary Blast Off Station, Officer in charge, P.O. Box 9998, Merritt Island, FL 32953-9998, USA. Text: "First Man on the Moon 40th Anniversary Landing Station"
USPS Postmaster, First Man on the Moon 40th Anniversary Landing Station, Officer in charge, P.O. Box 9998, Merritt Island, FL 32953-9998, USA. The Czech postal administation is commemorating the 60th Anniversary of the death of Czech rocket pioneer Ludvík Ocenasek (pronounce: Ochenáshek) with a personalized stamp and a meter postmark slogan type of cancellation used at the Prague 12 post office. 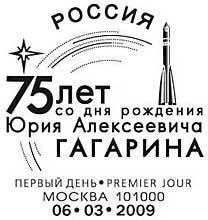 Both the stamp as the postmarker show a portrait of Ocenasek; the postmarker also carries an image of one his rockets. Ludvik Ocenasek was born into a poor mining family in Bohemia, Austria-Hungary (now the Czech Republic) in 1872. He taught himself to be a mechanic, and while working at that trade, succeeded in completing his education in a middle vocational school. At the age of 22, after working in a patent office, he opened his own machine shop in Prague, which in time grew into a medium sized industrial plant. Creativity marked Ocenasek's entire life, from the merry-go-round he designed and constructed at the age of eight, to the recoil device for firearms for which a patent was awarded to him two days after his death. In 1905, Ocenasek designed and built an aeronautical rotary engine similar to the famous French Gnome airplane engine. In 1910, he built a monoplane powered by a 50-horsepower rotary engine he had also invented, and on November 30, 1910, he flew it almost 100 feet, a considerable distance at the time. Inspired by reports of successful rocket experiments performed by Dr. Robert Goddard, engineer Max Valier, and professor Herman Oberth, with whom he corresponded, Ludvik Ocenasek turned his creative endeavors to rocketry and jet propelled boats, beginning systematic rocket research in 1928. He hoped to use liquid propellants such as alcohol or hydrogen and oxygen, advocated by both Goddard and Oberth, but ultimately used solid propellants instead. One of Ocenasek's ultimate goals was to utilize rockets for delivering postal mail via high altitude trajectories between continents. On March 2, 1930, in a field near Prague, Czechoslovakia, Ocenasek held his largest public demonstration, launching a variety of rockets. One of his two-stage rockets reached 4,700 feet, a remarkable altitude for rockets at that time. All of these rockets were propelled by gunpowder. He also developed a ground-launching apparatus to aid in overcoming obstacles in rapid rocket acceleration. Ocenasek later tried out reaction propulsion on riverboats, and even envisaged rockets launched from aircraft, the principle used half a century later by Orbital Sciences Corporation for their Pegasus launcher. If not for the Nazi occupation of Czechoslovakia in 1939, his research would have undoubtedly developed more innovative products and techniques. Ludvik Ocenasek died on August 10, 1949. Asteroid 61404 Ocenasek is named in his honor. UPDATE : It appears that the cancel to be used at Sindelfingen has been cancelled. The competitive stamp exhibition it was to be used for has. Identification number: not yet known. Ill.: Lunar Module, Astronaut in his space suit, lunar base. 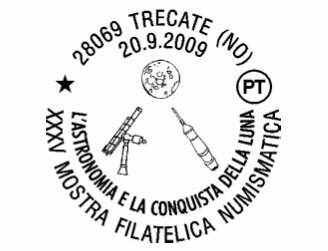 Text: "XXXV Mostra Filatelica Numismatica/L'Astronomia è la conquista della luna" (35th Stamp and Coin Show/Astronomy and the conquest of the Moon). 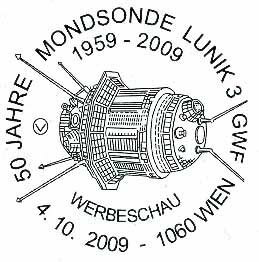 Ill.: lunar zond Lunik 3. 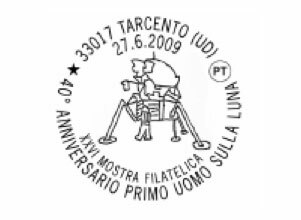 Text: "40° Anniversario Sbarco Primo Uomo sulla luna/4° Centenario Prime Osservazione Astronomiche" (40th Anniversary 1st Man on the Moon/400th Anniversary of the first astronomical observations). 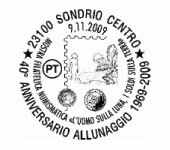 Text: "40° Anniversario Allunaggio 1969-2009/Mostra Filatelica Numismatica "Uomo sulla luna - I soldi sulla terra" (40th Anniversary Moon Landing 1969-2009/Stamp and Coin Show "A man on the Moon - the money on Earth"
Ill.: an Eagle, landing on the lunar surface; mothership Columbia. Note: Chris Calle designed this one.